In part 1, I looked at my first bikes. In part 2, I reminisced about my first performance mountain bikes. After the insurance payment for the Marin Eldridge Grade showed up, I went shopping for a new bike. A teammate of mine on Team Flowerchildren, Martin Stenger, was a factory racer for Slingshot Bikes, a small frame manufacturer in Michigan. Slingshot made one of the first full-suspension bicycles, using a technique that is odd, to say the least: the downtube of the bike was replaced by a steel cable that was anchored with a high-tension coil spring at one end. The entire front half of the bike was attached to the rear triangle by a fiberglass leaf spring. Thus, the bike hinged under the rider’s weight. The benefits of this design are many: really efficient climbing, excellent transfer of pedal power to the wheels, and excellent climbing ability. The drawbacks included a lot of lateral frame flex and a very frightening tendency for the frame to “fold in” on technical downhill runs. This was somewhat mitigated by running a shock fork, as well as a 1991 modification of the cable mount and spring location. The picture here is a mock-up of my frame. It had a grape rear triangle and a pumpkin front “triangle.” The top tube was a split design, with the spring mount about 1/3 of the way back from the head tube (the 1991 revision had the spring mount at the bottom bracket, with the cable attaching to the head tube). My Slingshot ran a mix of Suntour XCD and XC Pro components with 7-speed indexing, as well as Sun RinglÃ© rims, Specialized Ground Control 2 tires. The original, rigid fork that came with my Slingshot had a deformed steerer tube that destroyed the original headset – it was temporarily replaced by one of Martin’s spare forks, and later permanently replaced by a Scott Unishock coil-spring fork. It was a really unique looking (and riding bike). 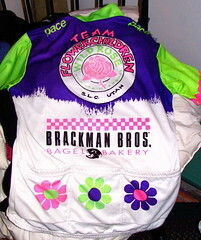 In my third year with Team Flowerchildren, I found new competition in the junior ranks, and failed to defend my overall series championship in the Utah Mountain Bike series. But I had a blast racing and riding the Slighshot. The rear derailleur was replaced by Suntour at the Deer Valley UCI World Cup race, upgraded to a XC Pro unit. I also had a set of Specialized Turbo/S ATB tires for road riding, which were very, very fast treads. I rode this bike until I went to college in Connecticut. At one point, I had it all boxed up to ship to Connecticut, but never managed to get it to the shipper. And sometime during the 1995-96 academic year, thieves broke into the garage at my mom’s house again, stealing both the Slingshot and my old Scott, while leaving my old Schwinn and a bike bought for my mom but never used. I still miss my Slingshot a lot. It’s the best bike I’ve ever owned, bar none.